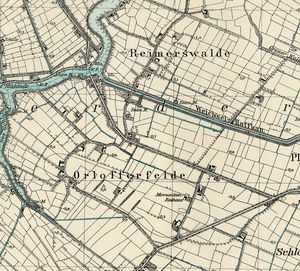 Detailed map of Reimerswalde and Orlofferfelde. Orlofferfelde (also known as Ohrlofferfelde, Orloffelde, and Orloffeld; now Orłowskie Pole; coordinates: 54.21528, 19.07139 [54° 12' 55" N, 19° 4' 17" E]; 1905 population, 227) is located approximately 3 kilometres (2 miles) west of Nowy Dwór Gdański (Tiegenhof) and 34 km. (21 mi.) south-east of the regional capital Gdańsk (Danzig). It was situated to the south of Reimerswalde, to the west of Platenhof and Tiegenhof, to the north of Orloff, and to the east of Pietzkendorf. Orlofferfelde originated in 1562, when the Loysen banking firm had Mennonites settle on the marshy land in the region of Tiegenhof, which the firm had received from the Polish crown in return for a loan, to drain and cultivate it. They settled about 12 miles (20 km) north of Marienburg in 20 villages and organized a congregation, holding their services in the homes and barns of the members. Not until two centuries later did they receive the consent of the authorities to build a church in Orlofferfelde, in which Cornelius Grunau, an elder from Ohrlorf, conducted the first service 5 December 1751. The congregation belonged to the Frisian branch and was very active. The number of communicant members rose to more than 500. In the last part of the 18th century their elders Heinrich Donner and Johann Donner were among the leading personalities of the West Prussian Mennonite brotherhood. In the 18th century the Dutch Naamlijst calls this congregation Waterlander. Until 1772 Orlofferfelde was located in what was known as Royal Prussia (also known as Polish Prussia) in the Kingdom of Poland. The First Partition of Poland in 1772 resulted in the creation of a new province in 1773, called West Prussia, in which Orlofferfelde was located. Orlofferfelde was situated in the district (Kreis) of Marienburg until the establishment of the Free City of Danzig in 1920. The village came under the control of Nazi Germany during World War II until February 1945, when it was occupied by Soviet forces and returned to Poland. Iin 2012 Orlofferfelde (now Orłowskie Pole was a settlement in the administrative district of Gmina Nowy Dwór Gdański, within Nowy Dwór Gdański County, Pomeranian Voivodeship. The following ministers are mentioned in the Naamlijst: Aldert Aldertsz, Klaes Bestevader, Hendrik Quiring, David Mekelborger, elder 1753-1771, David Horn 1753-1775, Gerdt Albrecht 1754-ca. 1760, David Bestevader 1753-ca. 1775, Jan Bestevader 1760-1787, Cornelius Grunou 1760-ca. 1795, Hendrik (Heinrich) Donner 1766, elder 1772, Jacob Penner 1766-1773, Hans Horn 1775-after 1802, Jan (Johann) Quiring 1775-after 1802, Peter Dan 1794-?, Cornelis Fröse 1794-?, Jacob Bergthold 1799-?. Repeatedly the congregation had contacts with the Dutch Mennonites. In 1709 and again in 1788, when its members were severely struck by floods, it received financial support from the Dutch Mennonite Committee of Foreign Needs (Inv. Arch. Amst. I, Nos. 1570, 1657, 1739-45; II, Nos. 2646, 2650; II, 2, Nos. 801, 856 f.). In 1852 the baptized membership numbered 315, in 1882, 256. Besides the Frisian congregation there was also a Flemish congregation with its seat at Ladekopp, whose members lived in some of the same villages as the Frisians. When the Prussian law on the corporation rights of the Mennonites of June 1874 was published, which stipulated that the area of the congregation must be geographically defined, David Fröse, the elder of the Frisian group, attempted to co-operate with the Flemish in defining mutually favorable boundaries; after initial failure, these efforts resulted in the union of the two branches in 1882, which Fröse, however, did not live to see. The Orlofferfelde congregation yielded its independence in some respects; the treasury and the economic care of the members were united. But the pastoral care and religious services and preaching remained unaltered in the two branches. Fröse's successor as elder of the Orlofferfelde congregation was Jakob Penner, a preacher of Platenhof, ordained 12 February 1882, who made it his duty to give the young people of the congregation more thorough baptismal instruction, better suited to the needs of the time. To this end he wished to supplement the Donner catechism, which was also used by the Flemish congregation, in order, as he wrote, "to impress upon the hearts of the children the necessary explanations and admonitions in answering the questions of the catechism presented to them." The conference in Tiegenhagen decided in 1886 to publish a unified catechism for the "United West Prussian Mennonite congregations," and Penner was one of the leading authors of this booklet. But the union did not come to pass. In 1906 the Ladekopp-Orlofferfelde group published a second edition of Heinrich Donner's Unterricht von der heiligen Wassertaufe of 1792 under the same title, with the additional phrase, "sowie über das Verhalten der Täuflinge vor, bei und nach der Taufe." The 1776 Prussian census lists 15 Mennonite families in Orlofferfelde, all members of the Orlofferfelde Frisian Mennonite Church, with the following surnames: Dircksen, Froese, Gerbrand, Grunau, Harms, Hein, Jantzen, Jopp, Nickel, Quiring, Schroeder, and Unger. In 1820 the village of Orlofferfelde had 169 inhabitants, of which 89 were Mennonites. The baptized membership of the Ladekopp-Orlofferfelde-Pordenau congregation (its official name at that time) numbered 756 in 1882, 707 in 1888; there were 1,141 souls in 1927, 1,021 (739 baptized members and 282 children) in 1940. The congregation possessed three meetinghouses, one in Ladekopp (built in 1768), one in Orlofferfelde (1751), and one in Pordenau (1800), and two old people's homes. In this congregation the Orlofferfelde branch had a degree of independence, with its own elder (Bruno Enss of Tiege, preacher 1933, elder 1935) and preachers. For the last ministers and the extinction of the congregation, see Ladekopp. "Familienforschung in Westpreußen." Hans-Jürgen Wolf. Web. 29 September 2012. http://www.westpreussen.de/cms/ct/ortsverzeichnis/details.php?ID=4889. Hege, Christian and Christian Neff. Mennonitisches Lexikon, 4 vols.Frankfurt & Weierhof: Hege; Karlsruhe: Schneider, 1913-1967: v. III, 310. Penner, Horst. Die ost- und westpreussischen Mennoniten in ihrem religiösen und sozialen Leben in ihren kulturellen und wirtschaftlichen Leistungen, 2 vols. Weierhof, Germany: Mennonitischer Geschichtsverein, 1978-1987: 253. Hege, Christian. "Orlofferfelde (Pomeranian Voivodeship, Poland)." Global Anabaptist Mennonite Encyclopedia Online. October 2012. Web. 24 Apr 2019. http://gameo.org/index.php?title=Orlofferfelde_(Pomeranian_Voivodeship,_Poland)&oldid=124536. Hege, Christian. (October 2012). Orlofferfelde (Pomeranian Voivodeship, Poland). Global Anabaptist Mennonite Encyclopedia Online. 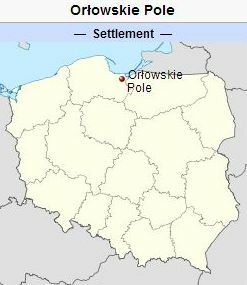 Retrieved 24 April 2019, from http://gameo.org/index.php?title=Orlofferfelde_(Pomeranian_Voivodeship,_Poland)&oldid=124536. Adapted by permission of Herald Press, Harrisonburg, Virginia, from Mennonite Encyclopedia, Vol. 4, p. 85. All rights reserved. This page was last modified on 10 September 2014, at 06:44.